Baseball player Adam Hall and his Aberdeen IronBirds teammates finished up their season with a 5-3 win over the Staten Island Yankees. The team’s report said, “The Star Spangled Banners finished up their season with a 5-3 win over the Staten Island Yankees. Nick Horvath’s homer highlighted the offense, Adam Hall continued a hit streak and Aberdeen ended up topping Staten Island in the season finale. “Flames sparks lead: In the top of the second Junior Soto and Jesus Bastidas had back to back singles. Miguel Flames smoked a double to right center to score both of them and make it 2-1 Yankees. “With Adam Hall on base in the bottom of the second, J.C. Escarra dropped a single into center and scored him. “Yahn got his second RBI with a bases loaded walk to score Escarra and give the ‘Birds a 3-2 lead. 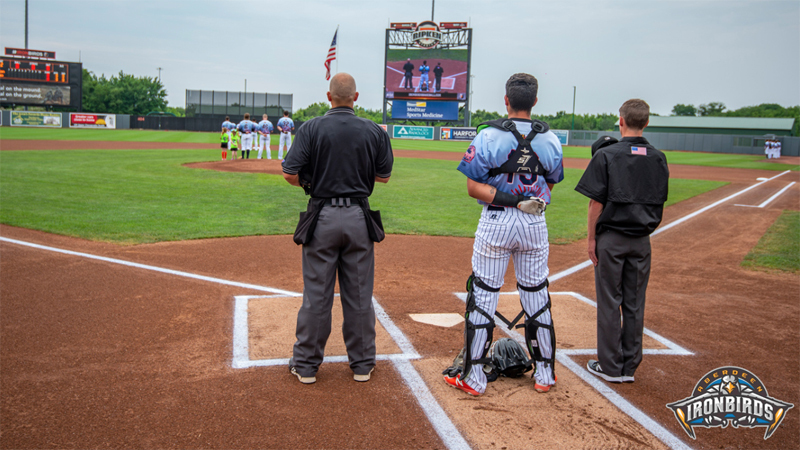 “Horvath hammers one: With Staten Island’s starter touching 98 MPH with his fastball, Nick Horvath turned on one and blasted a homer over the left field wall. It was his first as a pro and made the score 4-2 ‘Birds. “Adam Hall bumped an RBI single to center field in the fifth that scored Robbie Thorburn on his second walk.